What different tactics were used by both sides in an attempt to win the conflict in Vietnam between 1965-1968? 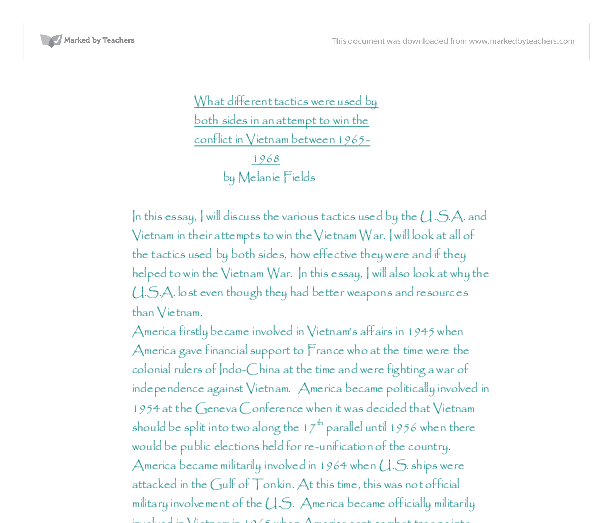 What different tactics were used by both sides in an attempt to win the conflict in Vietnam between 1965- 1968 by Melanie Fields In this essay, I will discuss the various tactics used by the U.S.A. and Vietnam in their attempts to win the Vietnam War. I will look at all of the tactics used by both sides, how effective they were and if they helped to win the Vietnam War. In this essay, I will also look at why the U.S.A. lost even though they had better weapons and resources than Vietnam. America firstly became involved in Vietnam's affairs in 1945 when America gave financial support to France who at the time were the colonial rulers of Indo-China at the time and were fighting a war of independence against Vietnam. America became politically involved in 1954 at the Geneva Conference when it was decided that Vietnam should be split into two along the 17th parallel until 1956 when there would be public elections held for re-unification of the country. America became militarily involved in 1964 when U.S. ships were attacked in the Gulf of Tonkin. 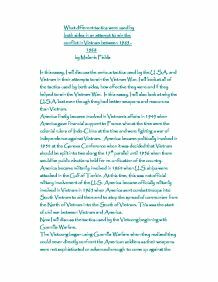 At this time, this was not official military involvement of the U.S. America became officially militarily involved in Vietnam in 1965 when America sent combat troops into South Vietnam to aid them and to stop the spread of communism from the North of Vietnam into the South of Vietnam. ...read more. These included the Bouncing Betty, which was a bomb with prods, and when it was stood on, it would bounce up and explode. The tin can trap was a bomb inside a can, and when it exploded, it would send shrapnel flying about. The Vietcong also used grenades with trip wires. This surprised and killed the American soldiers as they could not see the trip wire that the Vietnamese used. The Vietnamese often concealed these wires. This tactic was very effective as it terrified U.S. soldiers and sapped the U.S. morale. Altogether, Vietcong tactics were very effective. Now I shall discuss American tactics. The first tactic I shall discuss is financial aid. Before America became militarily involved in the fight against Vietnamese communism, they became financially involved. In 1956 they provided the French (who were then the colonial rulers of Indo-China which included Vietnam) with money to aid them in their fight against the Vietnamese who wanted too claim independence again and were rebelling against their rulers. This was ineffective as the French later lost this war at the battle of Dien Bien Phu and were driven out of Vietnam. The next tactic that I shall discuss is Military Equipment and Advisors. From 1958-1963, America sent increasing amounts of money, military equipment and advisors to aid South Vietnam in their fight against the communist North Vietnam. ...read more. used against the Vietcong as they were not used to this type of battle as the terrain was completely different to what they were used to. The Vietnamese won the war because they were battle hardened as they and been fighting ever since the Japanese occupation of Indo-China during World War 2. The Vietnamese were also used to the terrain that they were fighting on and developed better tactics to suit the terrain. The Vietnamese had many good tactics because they were battle hardened and suited to the terrain that they were fighting on. Guerrilla Warfare was effective, the Vietnamese Network of Tunnels was effective, the Ho Chi Minh was effective, the Relocation of Industries was effective, the Use of Women and Children was effective, the Major Offensives were effective and the Booby Traps used in combat were effective as well. The Vietnamese used very effective tactics all round. The Americans did not have very good tactics because they were not used to the terrain that they were fighting on, the country and its deadly wildlife and many of the American soldiers had never fought before. Financial aid was ineffective, Military equipment was ineffective, Military Combat was ineffective, Blanket Bombing was ineffective, Chemical Weapons were ineffective, Search and Destroy was ineffective, the Strategic Hamlet Program was ineffective and the use of Helicopters was effective. ...read more. Tactics used by both sides in the Vietnam War. The Vietcong built all there supply depots, weapons factories, and homes under the ground. This worked to great effect, the American were unable to destroy there under ground bunkers from the air. It also meant that when a bunker was found it was extremely hard to do anything about it. Why did the Communists win the Vietnam War? Additionally, the Vietminh forces were flexible and unpredictable. They retained the element of surprised unlike the American forces who, more often that not, used standard maneuvers that were easily anticipated. This contributed to the Vietminh's military success. So too did the impassioned and dedicated nature of the Vietminh fighters. This source is biased because is only gives a one sided view. It only shows us how America's actions led to the devastation in Vietnam but it does not show us the positive or beneficial side/factors of America's actions and involvement in Vietnam. Why did America Fail to Defeat its Vietnamese Enemies Between 1965 and 1969? I think this very significant in the Vietnam War because not did it only wear the Americans morale down, it also made them very worried and unsure. Another problem during the war was that the reasons for fighting the war were different on either side. Mart�n slowly imposed taxes and raised an army and the supplies necessary to sustain it. He also gained financing from another person who believed Lima (in Peru) could be attacked through the Andes. Once an army was gathered, Mart�n used sneaky tactics to fool his enemies. Overall, even though defoliation achieved its purpose, it was at a large price due to the amount of US soldiers and civilians that were killed or injured due to exposure. The platoon moved through the village and shot many Men, Women and Child even if not of military nature. Many children between the ages of 3 ? 5 were also killed. Afterwards, those who returned to the village claimed that it took three days to bury the bodies.